Joan owns Pristine’s, a fully stocked bead store in Fairbanks Alaska. This is a pattern from her book; Beaded Alive: A Natural Beginning. 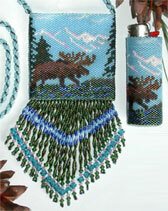 The Bag and the Bic lighter cover are stitched with Miyuki Delica beads – bead colors and bead counts can be found on the full color chart.